I saw a post recently that asks the question, “Do you really need one this fancy?” Well, I had a good long think about this, having written a few posts here, and came to the conclusion I don’t! My heating system consists of a Worcester Bosch Greenstar 28CDi Compact with a FW100 weather compensator controller. The controller isn’t particularly ‘smart’ but it does adjust the boiler output in an intelligent way, depending on an external temperature sensor, room temperature, return water temperature and parameters you can set yourself. This means the water temperature is the coolest necessary to provide the heating requirement, which in turn means the boiler is running at more efficient condensating performance than if it were at maximum circulating temperature all the time. Nearly all the ‘smart’ thermostats, with the exception of the Wave, which works similarly to the FW100, are simple on/off switches as far as the boiler is concerned. I thought carefully about upgrading to the Wave (anything else would be a backward step I felt) but realised what I really needed was a way to programme individual room temperatures. I was constantly turning the TVRs in the living room, for example, up in the early evening and down before I went to bed. One option would be wireless TRVs and I considered this in the multi-zone article. But when I worked out exactly what I needed I decided this was too complex. So I purchased a couple of cheap eQ-3 programmable TRVs to do this for me. These devices have a programme memory that can have up to 7 temperature changes per day and each day different. For now I have them set to do the same thing every day. I also fitted them in the bedrooms to make them warm in the mornings and cool the rest of the day. So far this arrangement is working well. The only thing I’m missing is the ability to adjust the main controller from my mobile phone, but as I hardly ever need to interact with it this is no great loss. All I need to do is remember to turn it off when I go out and, as it’s right by the front door, that’s no great hardship. Saved myself a few hundred quid too! 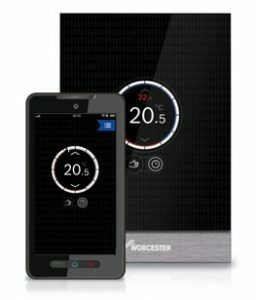 Worcester-Bosch have announced a new controller called the Wave that can be programmed and adjusted via a smartphone. Few details are available yet, but there’s a bit more here than is given on WB’s own site. The launch date* for the Wave will be 15th September. The good news is it works with WB’s proprietary boiler control system, Heatronic 3, and so can control the boiler parameters more accurately. Most other smart controllers simply replace the on/off thermostat control function. It promises weather compensation but using the internet weather reports rather than an external sensor. It fails my criteria for a true smart controller, however, as it doesn’t talk to individual TRVs, you have to set those yourself. There is a project to reverse engineer the Heatronic 3 interface and so there’s hope that some of the open source projects can extend the functionality to make it truly smart. Up-Update: News release dated 9th October! There’s also a FAQ and some videos. I’ve been doing a bit of research to try and find the cheapest way of creating a zoned heating system. 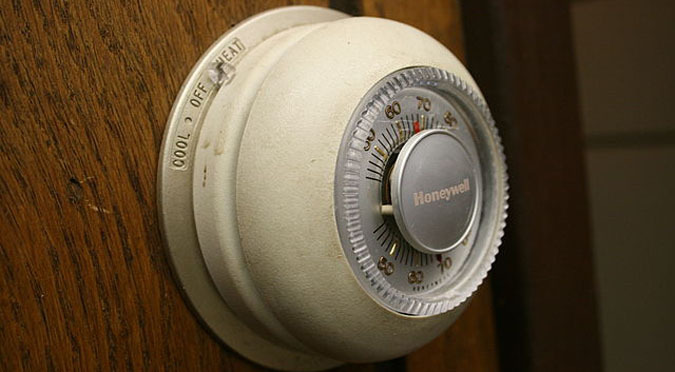 The baseline is the commercial products from the likes of Honeywell and HeatGenius. The Honeywell evohome with the special offer on a pack of four wireless TRVs will set you back £415, maybe less if you shop around. The HeatGenius will be an eye-watering £489 and that’s without fitting costs. So how to do it cheaper? Looking at Open Source solutions it seems there are a few options. OpenHAB is a good software solution that can be run on a spare PC, laptop (low power netbook with a SSD would be suitable) or a NAS box, no need to buy new hardware. This needs a suitable wireless dongle for communication with the TRVs and the Aeotech Z-Stick USB at £41 looks like a good solution. The cheapest wireless TRVs I’ve found are the StellaZ, which work on the Z-wave protocol and can be found for around £48 each. This is often a significant factor in the cost of multi-zone systems, the incremental cost of adding another zone is that of the TRVs, one for each radiator in the zone. So for four zones, assuming one TRV per zone, would come to just £280, significantly cheaper than the evohome and HeatGenius. Of course, setting this up will be harder than the commercial offering and probably only suitable for the hobbyist, but at least on paper it is possible to do it cheaply. SmartThings home automation system, recently purchased by Samsung, is starting to add more thermostats to their list of compatible devices. The latest is ecobee, a Canadian outfit. The SmartThings system uses the ZWave and ZigBee protocols, which means it has the potential to interface with a wide range of devices. The Honeywell Lyric seems to be yet another thermostat replacement with no boiler fine-control or TRV communication unlike their upmarket evohome system. The Conrad FHZ1000 (AKA ELV and eQ-3) uses the FS20 automation system and can control a large number or TRVs. I believe this is the same interface used by OpenTRV. A CUL dongle running culfw will also control a number of TRVs. There’s also a webinos project that also uses this protocol. What is a Smart Controller anyway? In looking at what is available on the market, I have been trying to categorise the different types of controller and what they offer. To begin at the beginning, there was a boiler connected to radiators fitted with manual valves and a simple mechanical thermostat on the wall to turn the boiler on and off. Unless the user spent considerable effort adjusting radiators and the boiler this was very wasteful of energy. Then the next level of sophistication is a timeswitch to override the thermostat when heating is not required but this still relied on manual control of the individual radiators if the user could be bothered. Then comes the TRV, which allows different rooms to be controlled individually. This takes away a lot of the pain of trying to balance the radiators to stop one room overheating while another is still warming. None of this is particularly ‘smart’, just mechanical switches and valves. So the next stage in to introduce electronic, wireless timeswitches that allow remote access from a smartphone or other device. These may even look up weather forecasts from the internet to modify the times and temperatures the boiler runs at. But the rooms themselves are still controlled by the mechanical TRVs. There are programmable eTRVs but these often talk neither to the controller nor the boiler. Some will detect an open window with an additional sensor or one built in, but can’t tell if the room is occupied or not. Detect the rooms that need heating and follow some heuristic to determine the appropriate temperature. Command the eTRV to set the radiator to the appropriate temperature. These are all fine, but in practice the user will be forever walking into unheated rooms and have to wait while the radiator warms up. So we need either a time machine to anticipate where the user will be in half an hour’s time, or the system will need to learn patterns of occupancy and have a sensible setback temperature to stop frequently used rooms from becoming too cold. Having established these criteria I shall endeavour to categorise various products. From what I have seen of the project so far, the OpenTRV system appears to be getting the closest to the ideal. The Register published this article in June 2014 with a round-up of the top systems available. It is in four parts and covers Apple’s new HomeKit framework, Heatmiser Wi-Fi thermostat, Hive, Google’s Nest, Tado and nCube. After I set up this blog I discovered Automated Home with a lot more detailed information and an HVAC category for the kind of products I’m interested in. There’s also a writeup of the author’s home automation project on his own house.